Michelle Holling-Brooks has been a certified professional in the field of Equine Assisted Therapies since 2000, and is a lifelong equestrian. 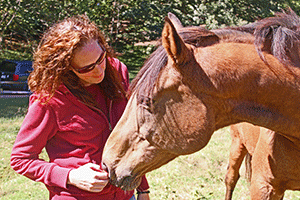 A life-threating illness in her early teens inspired her commitment to her work and the founding of Unbridled Change, a non-profit equine-partnered therapy organization, in 2008. Holling-Brooks has over 20 years of training with a number of organizations in the field including: EAGALA, PATH, and Natural Lifemanship. She is certified in Mindfulness and Life Coaching, is a Reiki Master, and has specialized training in the areas of trauma, PST, and attachment work.